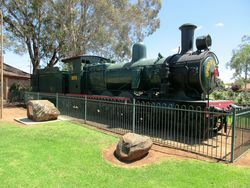 Locomotive 3075 stands as a memorial to the contribution made by the railway pioneers of Parkes. 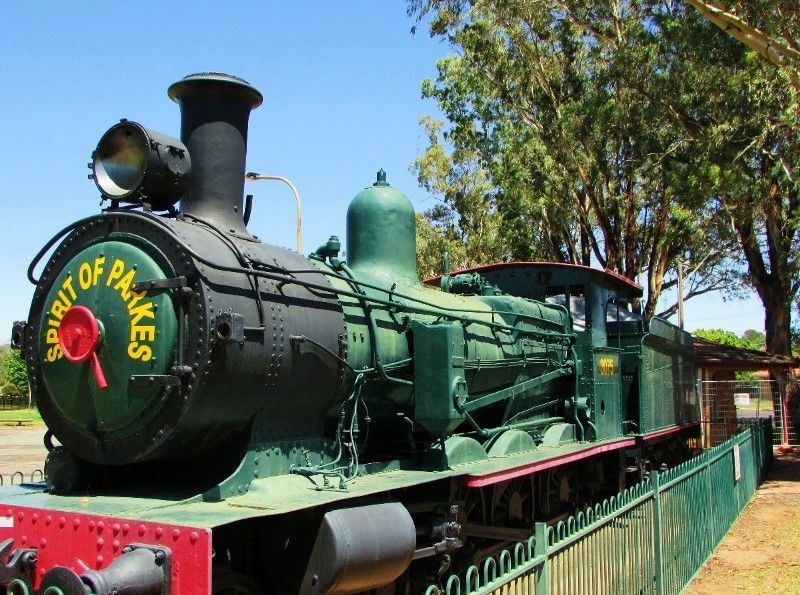 Parkes is located on the Broken Hill line which extends from Orange westward to Broken Hill covering vast arid country and continuing on into South Australia. 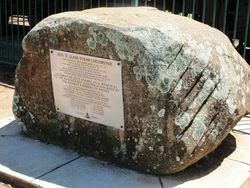 The single line opened from Molong to Orange on 18 December 1893. In 1898, a branch line between Parkes and Condobolin was opened, which ultimately became part of the Orange-Broken Hill line, which was finally completed in 1927. The station building and goods yard at Parkes opened on 18 December 1893, with a Station Master’s residence and water tank also completed for the opening. Some early additions to the station precinct included erection of a loading bank (1899), grain shed provided (1902), new 60’ turntable to replace existing 50’ turntable (1902) and extended coal stage (1903) (Forsyth, 2009). With the expectation of a world war in late 1909, there was pressure to construct a 'Federal Line' to provide a more secure route between Victoria and Queensland in order to improve Australia’s defence system. The first section of the Federal line opened from Narromine to Peak Hill on 12 December 1910, followed by the extension from Peak Hill to Parkes on 30 September 1914. By the 1920s, with the opening of further branch lines, Parkes had become a major railway junction for the transport of passengers and produce from many of the rural towns in mid-western NSW (Love, 1997). 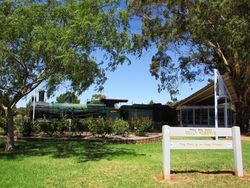 Numerous additions and changes occurred within the Parkes railway precinct throughout the 20th century. By the 1970s, with an increase in road transport and decline in rail travel, rail facilities at Parkes began to decline. However, Parkes continues to be one of the major freight interchange points on the NSW network and is an important link for east/west rail operations in Australia. Apart from much of the trans-continental freight it is also used by the Indian Pacific passenger train, and for a weekly passenger train. THE APEX CLUB RECLAIMED THE COPPER BOILER TUBES AND FIREBOX WALL BEFORE RESTORING 3075 TO ITS ORIGINAL GLORY AND PLACING IN POSITION AT KELLY RESERVE ON 10-8-75 HAVING SPENT 1600 HOURS ON THE PROJECT. LOCOMOTIVE 3075 STANDS AS A MEMORIAL TO THE MAGNIFICENT CONTRIBUTION MADE BY THE RAILWAY PIONEERS OF PARKES.